3D Systems’ On Demand team helped Metro Aerospace take the microvanes from a prototype into a production part with uncommon speed. Offering production support at any stage of product development, 3D Systems’ On Demand experts deliver quick, high quality parts ranging from fast turn and advanced prototypes to appearance models and low volume production. 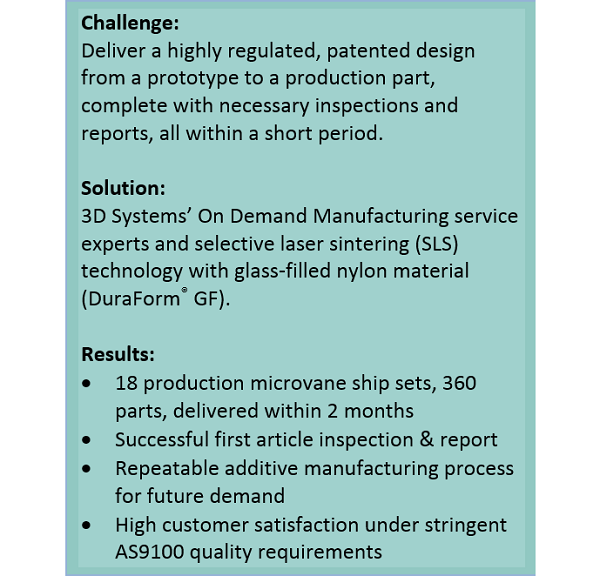 Using Selective Laser Sintering (SLS) and DuraForm® GF, a glass-filled nylon, 3D Systems’ On Demand team in Tulsa, OK, worked closely with Metro Aerospace to successfully complete a first article inspection report. This validated that all manufacturing requirements and part specifications were executed exactly as prescribed on qualified SLS machines. To learn more about the processes used and the results of the project, read the case study here.